There’s nothing worse than waking up after a night out and smelling like Ke$ha. You know, where your clothes immediately go into the dry cleaning pile, and your hair takes at least two washes to not smell like the inside of your “eccentric” aunt’s apartment. 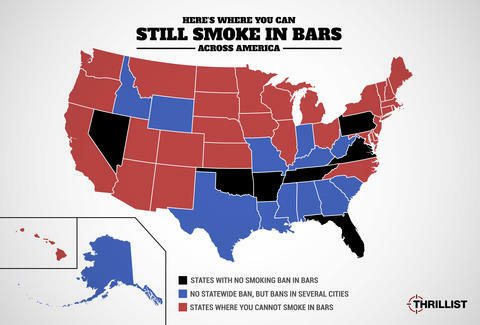 While many states have eliminated the odor by banning smoking in bars, that's not the case everywhere. No, as anyone who’s ever spent a weekend in Vegas or South Beach knows, there are still places in America where the nightlife comes complete with a thick cloud of cigarette smoke. And which states are those? Here’s our handy map, broken down by places where it’s outright banned* (red), only banned in certain cities (blue), or still completely legal (black). West Virginia: WV bans smoking by county, and 25 of them say no dice. Morgantown is in one of those 25. Connecticut: Only allowed in cigar bars that began operation before 2003 and that generate 10% of their revenue from cigar sales. Or casinos.